The Byzantine army continues to grow. 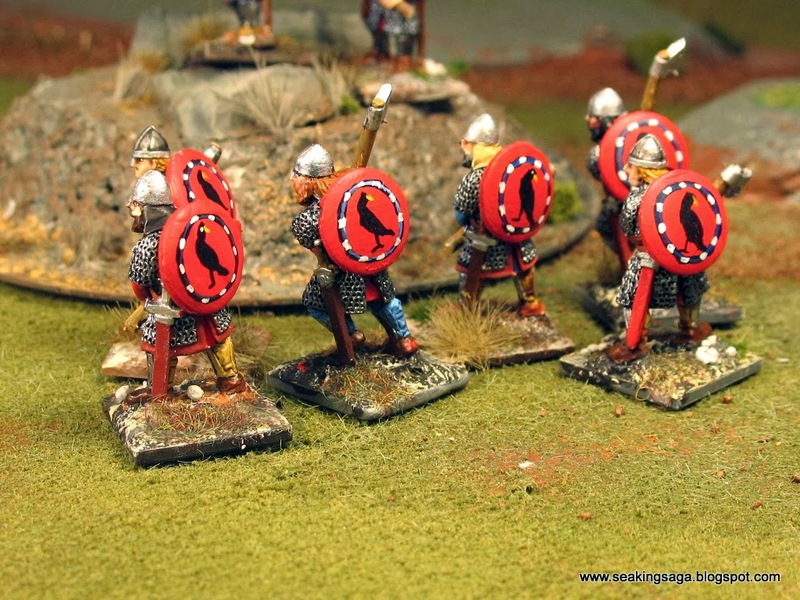 My work this week was a pack of Crusader Miniatures Varangians, a command pack and several plastic conversions. Turned with the shields shown. I generally prefer handpainted shields to transfers, even if the are a kittke too clean. A personal painting goal for this year is to work on weathering and damage. However, it is a little hard psychologically to do a nice job on a shield, and then paint over it and intentionally ruin your work. Harold Hardrada, center, with his command retinue. I do not know why it wasn't obvious to me before, but Harold probably shouldn't be given the appellation Hardrada ("Hard Ruler") during his Byzantine service, because he had yet to rule. Furthermore, according to most sources, that name does not appear in written records until well after his death at the Battle of Stamford Bridge. Several conversions are pictured above. On the left is a Byzantine artisan or merchant, flanked by two Varangian in their more formal tunics. The civilian is a Wargames Factory Numidian puttied up and painted according to this reference. 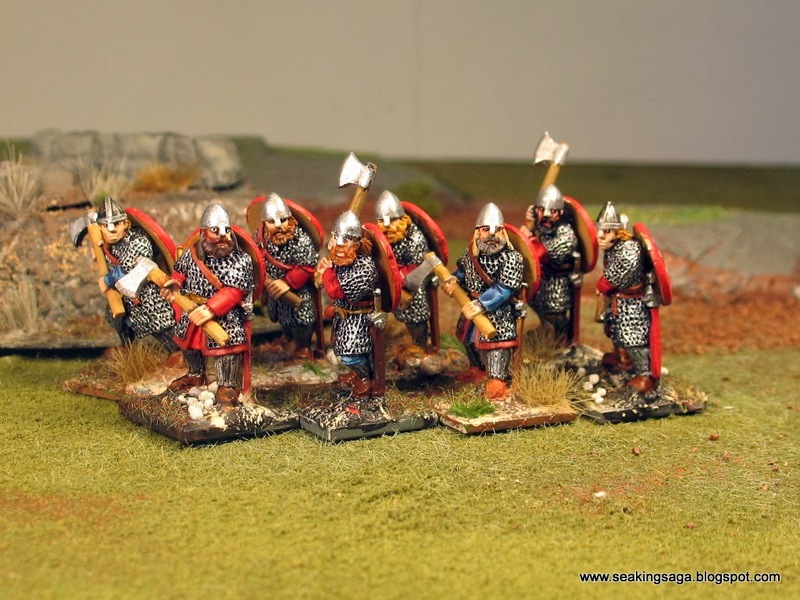 The Varangians are Conquest Games Normans with Gripping Beast Dark Age heads. The bases are from Happy Seppuku stamps. Wales in the late eleventh century was dangerous territory. A generally poor land divided into three kingdoms, it was nonetheless caught up in the machinations between Normans, Irish, Norse Gaels and its own rival rulers. Into this came the young Welsh prince Gruffud ap Cynan seeking to reclaim his kingdom of Gwynned from evil usurpers - at least, that's how he sees it. Jones should be commended for plucking Gruffud from history and into the pages of his first novel. As the author depicts him, Gruffud is not an invincible medieval superman (I am looking at you Uhtred). He is a powerful warrior and bright for his age, but impetuous and diplomatically naive. Jones can write a vivid and bloody battle. The violence is Homeresque in its detail: limbs are severed, teeth shatter, noses are rent from faces. The beatdown one of Gruffud's allies administers to an enemy is so brutal and sickeningly described that even our hero looks away in disgust. The characters, while mostly all warriors, are well shaded with different motivations and attitudes. The plot does follow many of the conventions and expectations of historical fictions, but I do not necessarily blame Jones for this predictability. Gruffud's life was one of almost constant battle and intrigue, the basic material for this genre - but do yourself a favor and do not wikipedia him until after you have read this book. One convention of historical fiction I would have liked to have seen included was a map of Wales in this era with the novel's locations marked. Highly satisfying, and I will be back for more when Mr. Jones brings us the next volume in Gruffud's life. 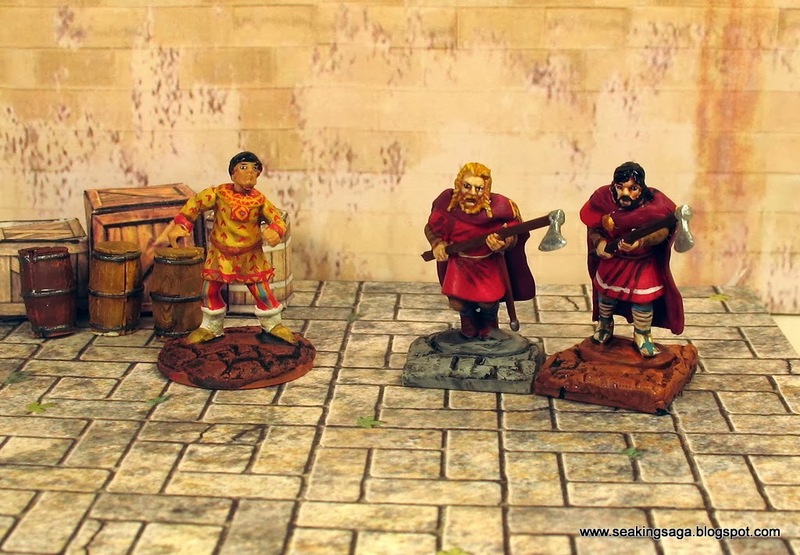 For wargamers, especially players of SAGA, there is a lot to enjoy. Battles are generally skirmishes, with Gruffud taking an active and leading role. 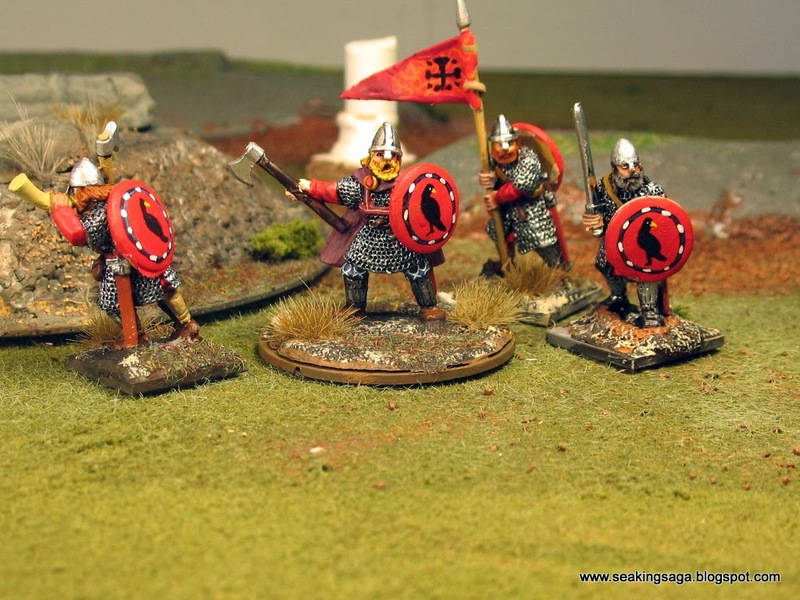 The differences in unit names, weapons and fighting styles of the Welsh, Norse and Normans are described in terms that button-counting wargamers will appreciate. So the following is my interpretation of Gruffud for SAGA based in part on history and on Ethan Jones' depiction in Birthright. 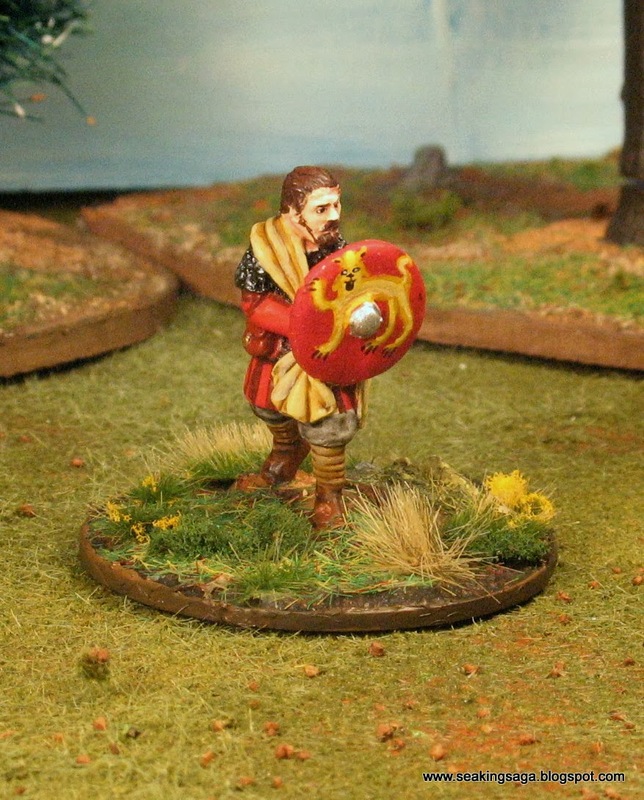 Gruffud, with the Lion of the House of Aberffraw on his shield. Across Britain in the eleventh century, alliances and territory shifted with an alarming frequency between Saxon, Viking and Welsh peoples. The arrival of the Normans on the Welsh Marches brought further strife to the region. 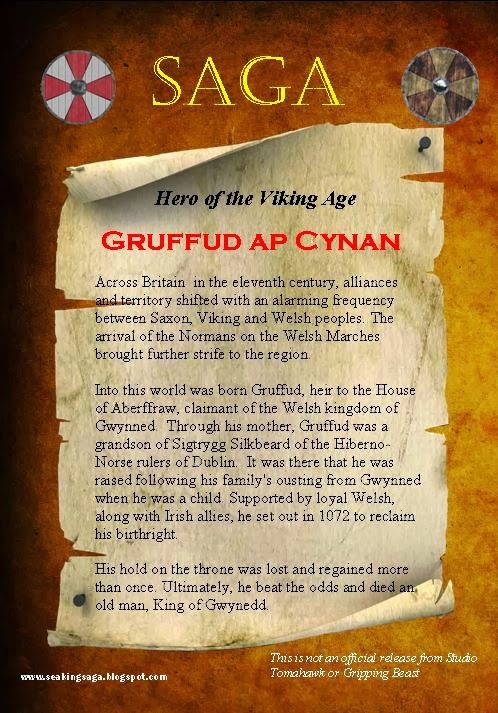 Into this world was born Gruffud, heir to the House of Aberffaw, claimant of the Welsh kingdom of Gwynned. Through his mother, Gruffud was a grandson of Sigtrygg Silkbeard of the Hiberno-Norse rulers of Dublin. It was there that he was raised following his family's ousting from Gwynned when he was a child. Supported by loyal Welsh, along with Irish allies, he set out in 1072 to reclaim his birthright. His hold on the throne lost and regained more than once. Later in his life, he was held captive by the Normans for at least a decade until his escape. Ultimately, he beat the odds and died an old man, King of Gwynedd. 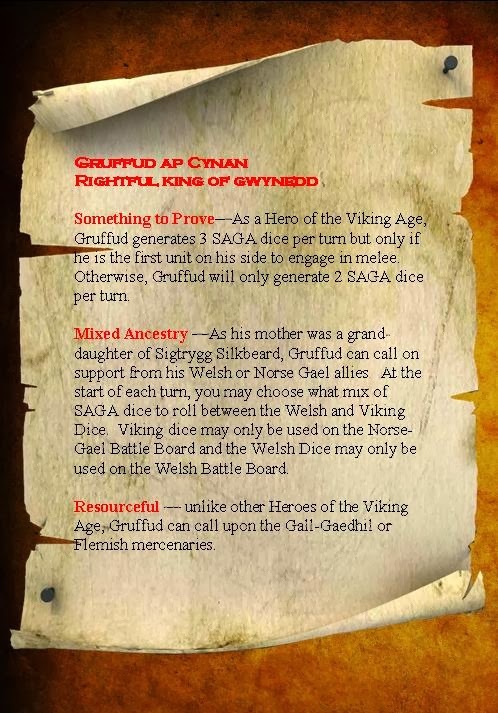 Something to Prove—As a Hero of the Viking Age, Gruffud generates 3 SAGA dice per turn but only if he is the first unit on his side to engage in melee. Otherwise, Gruffud will only generate 2 SAGA dice per turn. Note: the player will begin a game with three dice for Gruffud and keep them as long as the above conditions are met. Mixed Ancestry —As his mother was a granddaughter of Sigtrygg Silkbeard, Gruffud can call on support from his Welsh or Norse Gael allies. At the start of each turn, you may choose what mix of SAGA dice to roll between the Welsh and Viking Dice. Viking dice may only be used on the Norse-Gael Battle Board and the Welsh Dice may only be used on the Welsh Battle Board. Resourceful — unlike other Heroes of the Viking Age, Gruffud can call upon Swords for Hire units the Gall-Gaedhil or Flemish mercenaries. Let me know if you have any suggestions on improving his stats. I play tested it in a couple of short turn sequences. The use of two Battleboards is interesting and based on Cnut, but he is intentionally less powerful than your average Hero. After all, the historical Gruffud was marginally successful, but definitely not on the order of William of Normandy or Charlemagne! Update: I just fixed the link so that it can be opened without a request, sorry!